On this date in 1603, a man claiming to be the long-lost Portuguese king was publicly hanged on a square in the Andalusian city of Sanlucar. Dom Sebastian — so named because he was born on the Feast of St. Sebastian in 1554 — would be remembered longingly after his untimely death at age 24 as o Desejado, the Desired. What was truly desired was a return to Portugal’s golden age. One could say that trade was the calling-card of this realm of venturesome explorers, but there is no empire but that bears a sword, too. Sebastian, his young head probably bursting dreams of Alexander, undertook in 1577-78 to intervene under the glorious banner of Crusade in a disputed succession of the Moorish kingdom of Morocco. This sort of personal valor makes for great press in the woodblocks when things go to script, and the allure must be correlated to the disproportionate odds engaged in gratuitously chancing one’s royal person to war. Sebastian was unmarried and had no children; his own father had succumbed to consumption at age 17 so he had no siblings, either. When this sole pillar of royal authority suicidally crashed himself headlong into a superior Moroccan force at the so-called Battle of Three Kings, his chivalrous self-immolation exacted a crippling toll on his kingdom. An uncle in the cardinalate, Henry, was surprised to find himself suddenly elevated to the now-precarious Portuguese throne; Henry was 66 years old at the time and had taken vows of chastity that he could not maneuver to shed before he too died in 1580 with no heir at all. * In the ensuing succession crisis, the Spanish king soon swallowed up Portugal in a personal union. It was only natural that the many Portuguese distressed by this staggering sequence of events would indulge the dream of their late king. Besides having the advantage of being frozen in time at the height of his youthful potential, Sebastian had never actually been found after that bloody Battle of Three Kings — or, at least, the identity of the body that the Spanish produced in the way of ending discussion was deeply doubted. Without convincing royal remains, such a dream began to spawn here and there pretenders who would emerge from unhappily unified Iberia to claim the name and the patrimony of the lost desired king. The wild cast of longshot characters, according to Bryan Givens in Braudel Revisited, featured the likes of “the anonymous ‘King of Pernamacor’ in 1584; Mateus Alvares, the ‘King of Ericeira’ in 1585; and Gabriel Espinosa, the ‘Pastry-Maker of Madrigal’ in 1595.” These guys are claimants to a sleeping-king tradition aptly named “Sebastianism” which also fronted the prophecy of a visionary Azores blacksmith named Balthasar Goncalves who insisted to the Inquisition that the fallen King would return like a Messiah to liberate Portugal from Spain — and conquer Africa and the Holy Land — and defeat the Antichrist. ** These beliefs in turn eddied out of currents of already-existing mystical eschatology, like the Trovas of Antonio Goncalves de Bandarra from earlier in the 16th century, mystically prophesying the return of a Hidden King. Our man Marco Tulio Catizone (Italian link), a native of the south Italian town of Taverna, was one of these. In Venice he had made the chance acquaintance of an Italian mercenary who had joined Dom Sebastian’s catastrophic crusade, and this soldier was amazed by Catizone’s resemblance to the late king. Thus handed a compelling calling in life, Catizone announced himself the very man himself, who had wandered the world in penance after the battle but now would like Portugal back if you please. The Venetians jailed and then expelled him (in the vein of the “King of Ericeira” and the “Pastry-Maker of Madrigal”, this one is the “Prisoner of Venice”); the Florentines re-arrested him and eventually deported him to Spain; and in Spain under the gentle suasions of hostile interrogators he coughed up his real name and purpose and was condemned a galley slave for life in 1602. But no such sentence could squelch the desiring of a return to king and country, and for such a purpose the least plausible pretender could serve a sufficient rallying-point. 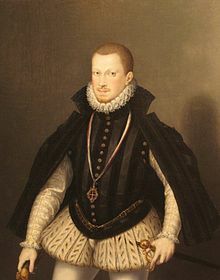 João de Castro, the illegitimate son of a Portuguese nobleman who would become “the St. Paul of the sebastianista religion”† met the imprisoned “Sebastian” in Italy and became the convinced herald of his return as Bandarra’s Hidden King, the restorer of Portuguese glory and the scourge of Spain and Islam alike. 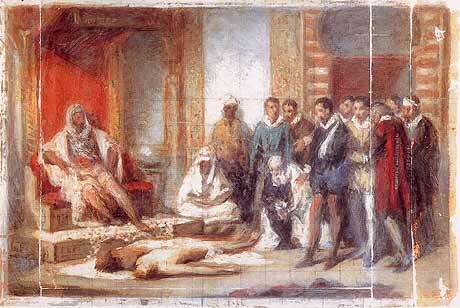 De Castro was nothing daunted by Catizone’s confession and confinement and from exile in Paris wrote a tome “with the license of the King” entitled Discurso da Vida do Sempre Bem Vindo et Apparecido Rey Dom Sebiao nosso Senhor o Encuberto, advancing the Prisoner of Venice’s claims. An attempt by De Castro and others like-minded to stir a Sebastianist rebellion in Lisbon in 1603 on Catizone’s behalf led to the latter’s trial for treason, with the outcome we have already noted. Yet even this did not abate de Castro’s prophetic vigor. * The best who could be advanced as the Cardinal-King’s homegrown successor candidate was an illegitimate cousin of the late Dom Sebastian. ** Instead of burning this fellow as a heretic, the Inquisition instead mercifully judged him a lunatic and released him to some intensive personal indoctrination. † J.L. de Azevedo in A evolucao do sebastianismo (1918), cited in Portuguese Studies Review, vol. 17, no. 1 (2009). With the death of the Protestant Queen Elizabeth and all her schismatic Anne Boleyn mojo, hard-pressed English Catholics greeted Jamie’s ascension hopeful of relief from official persecution. 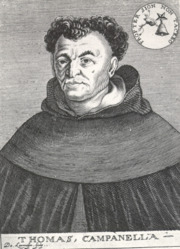 Although raised Protestant, both his parents had been Catholic. Watson was one of these hopeful adherents, and hastened himself to Scotland as Queen Elizabeth lay ailing to extract from the future English monarch the soothing blandishments of good favor that future monarchs make. assemble force and strengthe, and on Midsommer-day last, in the night, to come to the Parke pale at Grenewich, to enter in by the gardein with a key, that should be borowed; and when the numbers were come in, there should be a watche set at the dores of principall persons, and at the passages; and then to goe up to the KING’S loding. And when they cam to the KING, they should surprise his person, and carry him to the Tower, and they would move him for 3 things: — 1, for there pardon; 2, for tolleration of relligion; 3, for assuraunce thereof, to preferre Catholiques to places of credit, as WATZON the priest to be Lord Keper; GREY, Erle Marshall; GEORGE BROOKE, Lord Treasorer; and MARCAM, Secretary. They concluded to cutt of many of the Privy Councill, and to have made a Proclamation, purporting howe the KING had bene misled, and to have had many things reformed. They determined to have possessed the principall ports of the realme, and to have kept the KING in the Towre a quarter of a yeare. The Bye Plot was ironically busted by other Catholics — Jesuits, as distinct from “secular clergy” (clergy not affiliated with an order) like Watson. Jesuits and secular clergy were at loggerheads in this period over tactics, church structure … more or less everything. The need to steal the thunder of whatever restore-the-Church scheme the Jesuits might be cooking up might have helped precipitate Watson into such immediate and desperate disaffection. At any rate, these other more respectable fathers of the church blew the whistle on the Bye Plot lest it provoke anti-Catholic pogroms, and you’d have to concur with their estimate that taking the king hostage is the sort of thing that would have prompted some blowback. In the course of rolling up the now-exposed Bye Plot, investigators also caught wind of the parallel Main Plot, courtesy of one conspirator who was involved in both and unable to hold his tongue under torture. The Main Plot was a sketchier affair to a similar end, allegedly among Catholic-sympathizing nobles to depose James for his cousin. As befits its title, the Main Plot implicated much bluer blood than Watson’s: Lord Cobham,* Baron Grey, and the knighted soldier Griffin Markham. Oh, and a guy you might have heard of by the name of Walter Raleigh. The drama that unfolded on the Winchester scaffold that day was wonderfully narrated in the correspondence of Sir Dudley Carleton and well worth extracting at length. The two priests that led the way to the execution were very bloodily handled; for they were both cut down alive; and Clarke, to whom more favour was intended, had the worse luck; for he both strove to help himself, and spake after he was cut down. They died boldly both … Their quarters were set on Winchester gates, and their heads on the first Tower of the castle. Warrants were signed, and sent to Sir Benjamin Tichborne, on Wednesday last at night, for Markham, Grey, and Cobham, woh in this order were to take their turns … A fouler day could hardly have been picked out, or fitter for such a tragedy. Markham being brought to the scaffold, was much dismayed, and complained much of his hard hap, to be deluded with hopes and brought to that place unprepared. One might see in his face the very picture of sorrow; but he seemed not to want resolution … [and] prepared himself to the block. The sheriff, in the mean time, was secretly withdrawn … whereupon the execution was stayed, and Markham left upon the scaffold to entertain his own thoughts, which, no doubt, were as melancholy as his countenance, sad and heavy. The sheriff, at his return, told him, that since he was so ill prepared, he should yet have two hours respite, so led him from the scaffold, without giving him any more comfort, and locked him into the great hall … The lord Grey, whose turn was next, was led to the scaffold by a troop of the young courtiers … and thereupon entered into a long prayer for the king’s good estate, which held us in the rain more than half an hour; but being come to a full point, the sheriff stayed him, and said, he had received orders from the king, to change the order of the execution, and that the lord Cobham was to go before him … he had no more hope given him, than of an hour’s respite; neither could any man yet dive into the mystery of this strange proceeding. The lord Cobham, who was now to play his part, and by his former actions promised nothing but matiere pour rire, did much cozen the world; for he came to the scaffold with good assurance, and contempt of death. … [he] would have taken a short farewel of the world, with that constancy and boldness, that we might see by him, it is an easier matter to die well than live well. He was stayed by the sheriff, and told, that there resteth yet somewhat else to be done; for that he was to be confronted with some other of the prisoners, but named none. So as Grey and Markham being brought back to the scaffold, as they then were, but nothing acquainted with what had passed, no more than the lookers-on with what should follow, looked strange one upon the other like men beheaded, and met again in the other world. Now all the actors being together on the stage (as use is at the end of a play,) the sheriff made a short speech unto them, by way of the interrogatory of the heinousness of their offences, the justness of their trials, their lawful condemnation, and due execution there to be performed; to all which they assented; then, saith the sheriff, see the mercy of your prince, who, of himself, hath sent hither to countermand, and given you your lives. There was then no need to beg a plaudite of the audience, for it was given with such hues and cries, that it went from the castle into the town, and there began afresh, as if there had been some such like accident. And this experience was made of the difference of examples of justice and mercy; that in this last, no man could cry loud enough, ‘God save the King;’ and at the holding up of [the previously executed] Brookes’s head, when the executioner began the same cry, he was not seconded by the voice of any one man, but the sheriff. You must think, if the spectators were so glad, the actors were not sorry; for even those that went best resolved to death, were glad of life … Raleigh, you must think (who had a window opened that way), had hammers working in his head, to beat out the meaning of this strategem. His turn was to come on Monday next; but the king has pardoned him with the rest, and confined him with the two lords to the Tower of London, there to remain during pleasure. Turns out that James wanted to do only the minimum amount of butchery necessary to establish his bona fides, and it sure seems like the mercy play proved a public relations triumph. ** Raleigh was left by this reprieve languishing in the Tower for years, before his own final adventure saw him to the block after all in 1618. Would you like some bootless speculation that Raleigh’s being caught up in this mess led him to nurture during his imprisonment a decade-long grudge against William Shakespeare and eventually murder the playwright? Of course you would. In the world of more demonstrable historical consequences, the failure of these plots and continuing frustration with Catholics’ lot under a new boss who seemed a lot like the old led two years later to the ne plus ultra of English sectarian terrorism, Guy Fawkes‘s Gunpowder Plot to blow King James and his court straight to kingdom come. * Cobham was a descendant of John Oldcastle and is supposed to have forced Shakespeare to redact the family name in his Henry V plays — giving us, instead, the character of Falstaff. … there was another cross adventure; for John Gib could not get so near the scaffold, that he could speak to the sheriff, but was thrust out amongst the boys, and was fain to call out to sir James Hayes, or else Markham might have lost his neck. Topical sourcing: Mark Nicholls, “Treason’s Reward: The Punishment of Conspirators in the Bye Plot of 1603” The Historical Journal, Vol. 38, No. 4 (Dec., 1995).